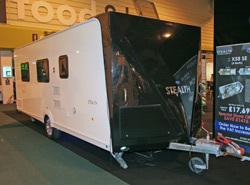 Our intrepid sleuths, Liz and Dave King, take a look at the Stealth caravans. The new Stealth X range of caravans made by Dunster House, was introduced at the International Caravan and Motorhome Show at the NEC in October. 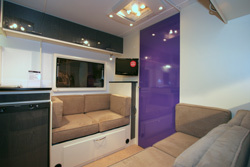 Built on AL-KO chassis, with traditional sandwich panel construction technique the three model range comprises the X53 two berth model, the four berth X58 and six berth X63. Each model is available in three different specification levels; S, SE and top of the range, SE-L.
You might be asking who Dunster House is and that’s a fair question. Established in 1994, it has showrooms in Bedfordshire and Lincolnshire and has a product portfolio that includes log cabins, climbing frames, garden offices, greenhouses, sheds, solar air heaters and dehumidifiers, decking, uPVC windows and doors and saunas. 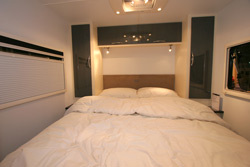 Caravans are new to the portfolio. We had a look at all three models (prototypes) and the layout is the same with a fixed 4ft 6ins island bed at the back, centre living and kitchen area and a washroom across the front end. What no big window to look out of, I hear you say. The matt cream veneer interior is complemented by high gloss laminate and the door from the bedroom to the living area was a very modern high gloss Indigo purple colour; there is an option of high gloss Graphite. Yet the interiors seemed to have a minimalist look with no curtains at the window. The kitchen is L shaped with a three burner hob, grill and oven and integral sink and drainer set in Graphite laminate worktops. The Combi boiler/heater is sited at the rear of the kitchen units, not easily accessed. There are several eye level cupboards and you’d have to decide for yourself what light items you would put in them. The fixed bed has no corners cut off, and this may appeal to some people. 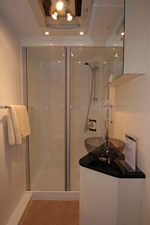 The shower cubicle is large with a “power shower”; a raised acrylic basin and a Dometic ceramic toilet complete the facilities. The exterior certainly catches the eye with a dramatic black high gloss aerodynamic nose cone. Will this catch your eye, too, in your rear view mirror at night? I asked Alex Murphy the enthusiastic managing director of Dunster House, who wants to modernise the caravan industry, about annual servicing; this will be available via a mobile network of service agents. We are not sure how this will work in practice. 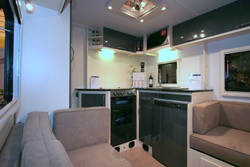 There are no retail dealerships for this unique range of caravans as the company has a direct selling policy. At the time of writing, the company is a member of the National Caravan Council (NCC) but its products had not been inspected and therefore are not NCC badged. A new UK manufacturer is welcome following the demise of two UK manufacturers in the last year or so. The Stealth range certainly has some modern touches with high gloss interior surfaces and spacious front end washrooms. The black high gloss nose cone also gives the Stealth a very distinctive look from the outside. We believe however that is a niche-market product and as with buying any caravan, prospective buyers need to do their research carefully before committing to their purchase. As mentioned, the models we looked at were prototypes and so it will be interesting to see the finished article. Three year warranty and six year anti-water ingress. *Price includes Stealth X58 S at £17,114, with optional extras AL-KO ATC trailer control at £390 and AL-KO secure wheel lock at £155. **Caravan insurance cost based on 2010 Stealth X58 S valued at £17,659 fitted with hitchlock, wheelclamp, AL-KO axle wheel lock and ATC trailer control. Kept on drive behind locked gates at HX2 7RZ. Caravanners over 30 years old, claim free for 3 years and a member of a caravanning club. Online discount applied. Premium includes insurance premium tax at 5% and is correct as of 16.11.09.